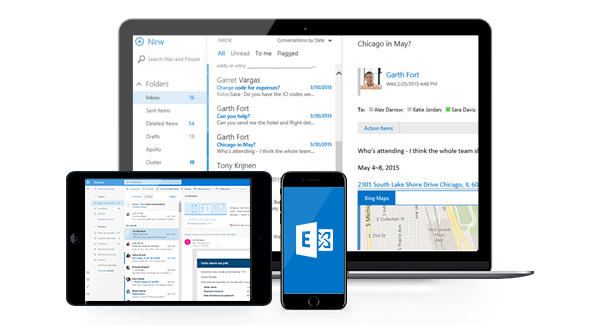 Hosted Exchange is the most widely used business messaging platform which combines an advanced email solution with collaboration and information sharing features. Investing in a Hosted Exchange plan = Investing in your business's productivity. Store and share company contacts and calendar with everyone in your organization. Send large files up to 50 MB, no need to struggle with file compression or to separate files in different emails. SSL secure email data transmission and connection between your Outlook client and the Exchange server. Synchronization in real time of all your devices (iPhone, Blackberry, Android and Windows). Recover deleted mailbox items (email, appointments, tasks, etc.) for up to 14 days. Get powerful Exchange hosting backed by a responsive technical Support to keep you focused on business.